P.S. Any and all updates on the Scar-H Redux version will be posted to my Youtube channel. Some of the videos will be linked in the mod description. If lowered weapons does not work for you, use Button Lowered Weapons instead. It does the same thing and more. I'm not doing 3rd person animations. More than one alternate barrel probably will not happen. The animations change when you add the angled foregrip, not the quick eject magazine. I DONT do third person. 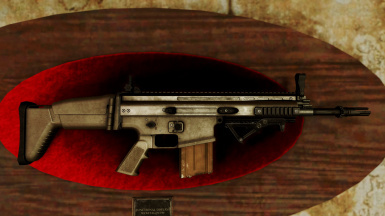 I pray that SCAR-H Redux has been released every time I login nexusmods. He posted a video about a week ago where he said "soon". This is not a bad gun as is, not sure why author is so down on it. 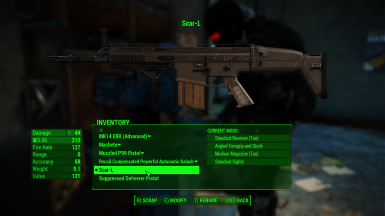 Other mods have crazy numbers of mods, but as an auto-.308 with damage numbers that feel sensible, this actually fills a niche, while also feeling pretty solid. Just wanted to chime in that I, too, look forward to seeing what the new version brings. 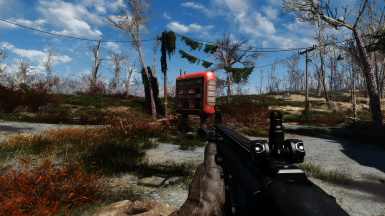 Should be awesome, because IMHO this is a pretty damn well done mod already. It can only get better! Same. Things gonna blow up on the Nexus as soon as he uploads it. So is the Redux not being worked on anymore or what? Hey, I am trying to outfit an entire army with this gun, I can't find enough of them. I tried to use the command given in the description, but it didn't work. Could I get any advice or a different code or something? Much appreciated. In the console, type "help scar 4 weap" (without the quotation marks), and it will show you the baseid for the weapon (it's different for everybody given where it is in your mod load order). Then all you need to do from then on is type "player.additem [baseid given] [quantity you want]" (without quotations or brackets) and they'll be added to your inventory. I just noticed that when i leveled up my rifleman perk, the damage doesn't increase, and the gun is getting underpowered even with the +100% dmg and powerful reciever when i level up more and more. I set my SCAR as 308 semi auto, does the game count the SCAR as "Semi Automatic Rifle"? I just did a quick search on google and I kinda know what to edit but it looks confusing to me. What did you do exactly there? Also about changing weapon type from automatic to semi? It only works with Standard Reciever, i tried to change Powerful Reciever the same way, but don’t know why it does not work. So, I adjust damage modifier in Standard Reciever and make it equal to Powerful Reciever. For the range, I just changed it in the main tab (the gun, not the barrel). “MinMax range is 256”, changed into 512. I’m kinda busy this week, I will describe in more detail when I finish my work. I’m not an expert on fo4edit. Not sure if this way is appropiate, but it does work for me and hasn’t cause any bug yet. Thanks! this is amazing I didn't know that ! 7) This should change the gun range to around 200 like any rifle with "long barrel"
4) In the right panel. Scroll down until you find "Property" that is set as "WeaponTypeAutomatic"
thx a lot for detailed info; what I couldn't understand was where to get [KYWD:0004A0A1] .... And thx again, that weapon is really beautiful but was kind of useless without the rifleman perk. New version is missing the Desert Tan camo and Hand placement has been moved to a very weird position. Out-Left, Forward and Rotated forward to far, like the gun is being held by the base of the pinky finger and not much else. When not using Angled ForeGrip and Stock. Silencer is missing various Camos compared to the rest of the gun. Acog scope is set to Far Forward and its aperture is entirely too narrow to be useful. Standard Barrel has NO Other options (intended?) . Please add 7.62 round compatibility. Hi, is there a fix or way to fix the horrible amount of glow present on the eotech reticle/sight? The 2d one is obnoxiously oversized and useless and the 3d one is pretty but I find it's unusable at dusk all through the night, and it makes shooting at anything out of melee range impossible thanks to the glow. I've tried changing my graphics settings to reduce bloom and i see no difference in setting. 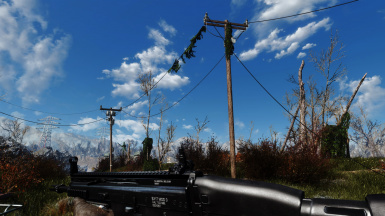 I really like the gun but the serious lack of quality with the scopes and reticles makes it a struggle to use. I'd happily make the texture change if provided with the file so you can update the mod because i know not everyone is familiar or skilled with image manipulation software whereas I am. what file does not have LL i dont want ncps to have? Will NPCs spawn using this weapon? If so what level do I need to be? Thanks! In the current version, you find one in the Museum of Freedom. Right before you reach the room with Preston & friends, there will be a Nuka-Cola machine. To the left of that is a table with the rifle laying on it.